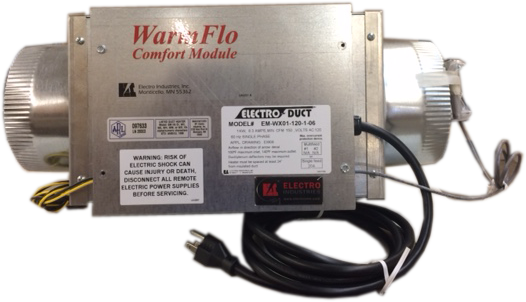 The WarmFlo Defrost System for the RecoupAerator® is a high-efficiency, cost-effective feature that allows the air filtration/ventilation system to function year round, and should be considered a required add-on for customers living in cold-weather states. Many competing systems may not fully function, or function at all, when the weather drops to certain below freezing temperatures, preventing customers from receiving clean indoor air during certain times of the year. UltimateAir’s defrost system was designed to be able to incorporate WarmFlo so your whole house filtration and ventilation goes uninterrupted, no matter the outdoor climate. WarmFlo works by warming incoming air before it reaches the RecoupAerator®, allowing it to pass safely through the system’s filter and into the home. Highly recommended in cold weather climates where temperatures drop to 10°F for extended periods of time. Visit the NOAA’s website for their Physical Sciences Division to get official climate information for the area you live in.